Summon: Deal 4 damage to all enemy creatures. 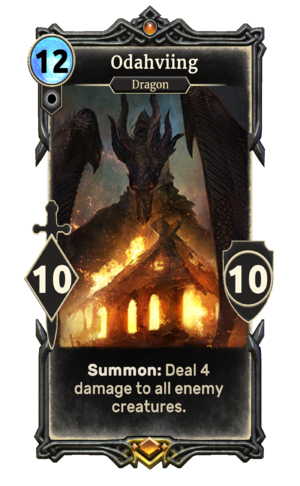 Odahviing is a unique legendary Neutral creature card. It is part of the Core Set. "You must prove your mastery, mortal." "Your Thu'um is no match for mine!" Odahviing first appeared in Skyrim. For more information, see the lore article. "Yol Toor Shul", the card's attacking audio, is the shout for Fire Breath. This page was last modified on 15 February 2019, at 22:12.